Dubrovnik, the Pearl of the Adriatic, the highlight of the 15-day Croatia is cruising on the route R4, which is exclusively driven by our motor yacht MY Vita. Enjoy a vacation on a yacht of the premium class. From 11:30 am to 1:00 pm, boarding time in the port of Rijeka. If you arrive by your own car, you can proceed to the port already from 10:00 am. Our service-team will lead you to the garage where you can leave your car. Of course, they will also bring you back to the port. After embarkation, our representatives will welcome you aboard with a drink and you will meet the crew and your fellow passengers. After having a snack, we will start our cruise heading towards our first port of call – the Island of Rab, where we will enjoy a walk through the historic town, accompanied by a local tour guide. The old town of the homonymous capital of Rab, with its impressive bell towers, stretches around a narrow, rocky promontory, flanked by water. Three streets pass through the old town – the “Lower Street” (Donja Ulica) with cafés and pubs, the “Middle Street” (Srednja Ulica) with boutiques, souvenir shops and ice cream parlours, and the “Upper Street” (Gornja Ulica), which leads to the four churches with their impressive bell towers. Dinner and overnight stay in the port of Rab. We will leave the Kvarner Bay and head to Dalmatia. After a swim at the small Island of Maun, we will reach Zadar, the centre of northern Dalmatia. 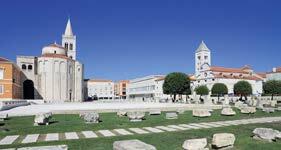 After arriving in Zadar, a local tour guide will await us to take us on a walk through the walled old town, showing us unique sights like the Roman Forum, the circular church of St. Donatus, or the Cathe dral Sveta Stošija (St. Anastasia). Enjoy traffic-free streets with elegant boutiques and countless cafés, or listen to the sounds of the worldwide unique Sea Organs on the Riva, their melodies created purely by waves. Overnight stay in Zadar. 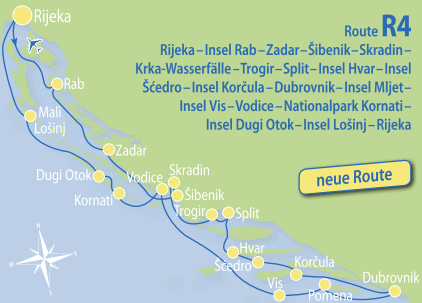 After approximately four hours sailing, we will leave the Adriatic Sea and turn into the embouchure of the River Krka. After our on-board lunch, we will tie up in Šibenik. Šibenik, mentioned for the first time in 1006, is the youngest of the larger cities on the coast, and at the same time, the oldest Croatian town as it was not built by Greeks, Romans, or Byzantines, but founded by Croats. The most famous building in the fortresslike old town is St. Jacob’s Cathedral, the most important Renaissance monument in Croatia. After a guided walk through the old town, we continue upstream the River Krka. 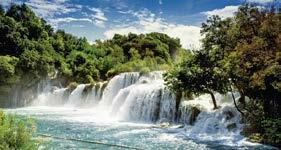 We anchor in Skradin, right before the famous Krka waterfalls. Overnight stay in the port of Skradin, where you will have the opportunity to go out for dinner. From Skradin, smaller boats will take you to the National Park. You will have the opportunity to visit “Skradinski Buk”, the most popular part of the waterfall area, where in 17 falls, with up to 100 m broad cascades, the Krka rushes 45.7 metres down. Make sure you do not forget to bring your bathing suit – a swim in the clear waters of the River Krka just below the falls is a truly unique experience. Park entrance, including boat ride € 12–15, payable on-site). After lunch on board, we will head for Trogir, where we will spend the night and have the opportunity to visit one of the numerous restaurants for dinner. After breakfast, we will go on a guided tour of Trogir. 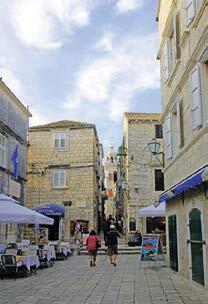 With its beautiful old town, protected by the UNESCO, Trogir is also called “the Museum City”. Enjoy the experience of a guided walking tour through the winding streets and discover impressive walls, towers, churches, frescoes and vaults. Do not miss out on taking a look into the unique old yards. Afterwards, we will head for a secluded bay. After having enjoyed swimming and sunbathing as well as lunch, we will set sail for Split, our next port of call. Split is Croatia’s second largest city and the capital of Dalmatia. The 1700-year-old city was once the palace of the Roman Emperor Diocletian, and is today a UNESCO-protected site. After a guided city tour, you will have the rest of the day at your disposal to discover the old town on your own and to enjoy the bustling Mediterranean atmosphere on the famous promenade of Split. For dinner, you may visit one of Split’s numerous restaurants. We will leave the Port of Split in the early morning and sail to the Island of Hvar. The island is known for its mild climate and vast lavender fields. Here you can also buy lavender – either as essential oil in small bottles, or as dried flowers in small cloth bags. The harbour of the homonymous main town lies at the foot of an island fortress, from which you will have a fantastic panoramic view over the offshore island group of “Pakleni otoci”. After about 2–3 hours in Hvar, we will continue to the small Island of Šćedro, where we will have plenty of time for swimming, sunbathing and lunch. After lunch, we will set off for our next port of call, Korčula on the Island of Korčula, where you will have the opportunity to go out for dinner. In olden times, Korčula was also called the “Black Island”, because of its vast pine forests, which used to cover the entire island. Korčula, the homonymous capital of the island, has one of the most beautiful old towns in Dalmatia. Because of its fortress-like appearance it is often referred to as “Little Dubrovnik”. 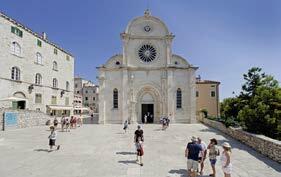 After breakfast, you are invited to enjoy a guided tour through the birthplace of the famous sailor and explorer Marco Polo, before we continue on to Dubrovnik. We will leave Korčula after lunch and we are supposed to arrive in Dubrovnik by 5 pm. It takes only a few minutes by bus to get to the old town. The bus stop is located right next to the port, the bus leaves every 15 minutes, last return journey around midnight. Tickets are available from the kiosk (12 Kuna per ride) or on the bus (15 Kuna per ride). For dinner, you may visit one of Dubrovnik’s numerous restaurants. The entire day is at your disposal to discover the amazing town of Dubrovnik. Dubrovnik is also called the “Pearl of the Adriatic”, since in the Middle Ages the city counted among the most important economic and cultural centres of the Mediterranean area. Today, the Old City unfolds a unique open air museum boasting countless attractions and secrets to discover. After breakfast, you are invited to enjoy a guided tour through the historic town with its impressive walls. After the guided city tour, you will have plenty of time to discover the gems of Dubrovnik on your own. Stroll through the famous “Stradun”, take a walk along the impressive city walls and visit the numerous unique sights. For lunch, you will have the opportunity to go to a restaurant, while dinner will be served on board. Today, we will leave Dubrovnik heading to the Island of Mljet. On our way, we will anchor in a secluded bay to enjoy a refreshing dip in the crystal-clear sea and our on-board lunch, before anchoring in the bay of Pomena on the Island of Mljet. Part of the island was declared a national park – two saltwater lakes (in the larger one there is a small island with a former monastery) are connected only by a narrow channel to the sea. Do not miss the opportunity to visit the National Park (entrance fee approx. 10 €, boat ride to the monastery approx. 3 €, payable on-site). We recommend that you bring your bathing suit, since the temperature of the salt water lakes is always 2°C above the temperature of the sea. Overnight stay in Pomena, where you may enjoy dinner at a restaurant. Today, we will visit the “forbidden” Island of Vis. The Island of Vis was closed to foreign visitors until the end of the 1980s. Where there was once an Air Force runway, now there are vineyards. After having had plenty of time for swimming, sunbathing and lunch in a secluded bay, we will head to the port of Vis, where we are supposed to arrive in the late afternoon. For dinner, you may visit one of the island’s restaurants. After sailing approx. 4–5 hours, we will reach the small Island of Zlarin, where we will stop for swimming, sunbathing and lunch. Afterwards, we will continue our voyage to Vodice, a bustling holiday resort on the mainland. For dinner, you may visit one of the numerous taverns and restaurants. According to the Irish author George Bernard Shaw (who in 1925 received the Nobel Prize in Literature), ”On the last day of creation, God crowned his work, and thus created, out of tears, stars and breath, the Kornati Islands”. The beautiful scenery, countless small and large islands (according to local lore “an island for every day of the year”), and the beautiful sea – all this makes the Kornati Islands a unique paradise. It is the largest and most dense archipelago in the Adriatic Sea – it comprises 147 islands, islets and reefs, with a total area of 69 km 2 , spread over 230 km 2 . They cover an area of 35 km of length and 13 km of width among the islands of Dugi Otok in the north-west, Žirje in the south-east, and Pašman, Vrgada and Murter in the north and north-east. 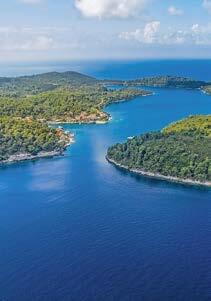 We pass the Kornati along their entire length and head for a bay on the northern end for a swim and on-board lunch. Overnight stay at one of the ports of the Island of Dugi Otok or a neighbouring island. Tonight, Captain’s dinner will be served. Today, we will leave the Dalmatian waters heading to the Island of Lošinj. Located in the Kvarner Bay area, Lošinj is not only known for its 300 cloudless or only slightly clouded sunny days per year, but also for being covered by dense pine forests. With a bit of luck, we will maybe spot dolphins playing in the waves; in the waters around the Island of Lošinj, there are more than 160 dolphins registered by the “Adriatic Dolphin Project”. After lunch and a swimming break in one of the island’s secluded bays, we will reach Mali Lošinj, where we will spend the evening and the night. For dinner, you may visit one of the numerous restaurants. Passing the west coast of the Island of Cres, we will head for a bay to enjoy lunch and a last refreshing dip in the crystal-clear water, before returning to Rijeka. Overnight stay in the port of Rijeka, where you may go out for dinner.